The high school faculty department of De La Salle Santiago Zobel held its Program Evaluation and Planning (PEP) workshop in Forest Club last 14-15 April 2010. One hundred and four teachers were in attendance.Founded in 1978, DLSZ is a member of De La Salle Philippines, a network of 17 schools all over the Philippines run by the Brothers of the Christian Schools or Fratres Scholarum Christianarum. It offers co-educational pre-school to high school education.This was the third group from DLSZ in the last three years. Summer Saya Tungo sa Pagkakaisa! Thirty teachers from St. Albert the Great School (SAGS) traveled all the way from Dagupan, Pangasinan to for an overnight team building and bonding activity last 11 to 12 April 2010. The group was led by the school owners, Mr. and Mrs. Alberto Carvajal. SAGs was founded in 1994 and offers pre-school, elementary and high school education.The event was organized by RSS Events and Tours Consultancy. For more photos of the event, kindly click here to visit our multiply page. Go! Go! Go! Allez! Allez! Allez! Another group that took advantage of the public holiday last 9 April 2010 was Allez Hop! Body Balance and Wellness Centre, a boutique studio in Legaspi Village, Makati. Led by its owner and general manager, Ms. Francesca Ballmer, eighteen fitness experts spent the whole day undergoing team building games. For more photos of the event, please visit our multiply site. 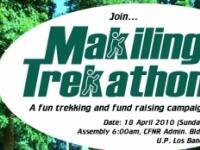 Join the Makiling Trekathon, a fun trekking and fun raising campaign, this 18 April 2010 at the UP Los Banos campus. 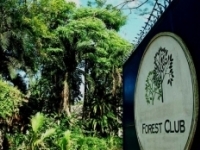 Theevent is part of the 100th foundationanniversary of the College of Forestryand Natural Resources (CFNR) and the centenary of the establishment of MountMakiling Forest Reserve. This summer Forest Club will be host to a number of student organizations for their year end assessment and planning sessions. The student council of San Beda College Alabang, led by its president Nicolas Ray Esquivel, was the first to hold such an activity last 29 to 30 March 2010. Formerly known as Benedictine Abbey School, SBC-A was founded in 1972 and initially offered classes in grade school and high school. The tertiary level was opened in 1995 and currently offers courses in business and other fields.To view more photos of the event, please visit our multiply site. Philippine Blue Cross Biotech Corp.
Fifty employees of Philippine Blue Cross Biotech Corporation spent a whole day in Forest Club last 27 March 2010 for a team building activity using Forest Club's Eco Adventure modules.Philippine Blue Cross is an importer and distributor of drugs and medications. To view more photos of the event, kindly visit our multiply site. Please check out our 2010 rates which will take effect on 1 May 2010.All guests booked for 1 May 2010 and later who have paid their reservation fees or made down payments are exempt from this rate increase.